Courtesy Jensen Motor Boat Co. Beyond the rather impressive presence of the building, and the sheer number of customers, what assures Anchor Jensen’s place in motorboat lore is the design and construction of two champion hydroplanes, Slo-mo-shun IV and Slo-mo-shun V. The former won three Gold Cup events on Lake Washington, and a Harmsworth Trophy, raced on the Detroit River. 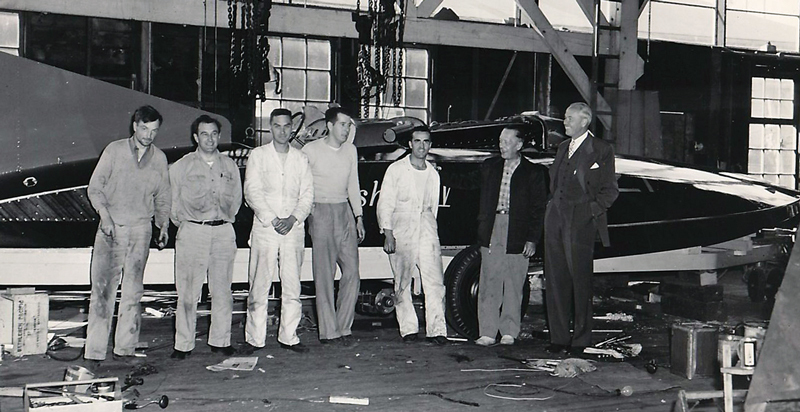 It is said that the people of Seattle developed a deep affection for hydroplane racing, thanks to Jensen, embracing him as a city icon. In addition to the boats’ success in competition, Slo-mo-shun IV also set two straight-line speed records: 160.32 mph in 1950, beating the 1939 record set by Sir Malcolm Campbell by 18.58 mph; and 178.4 mph in 1952. 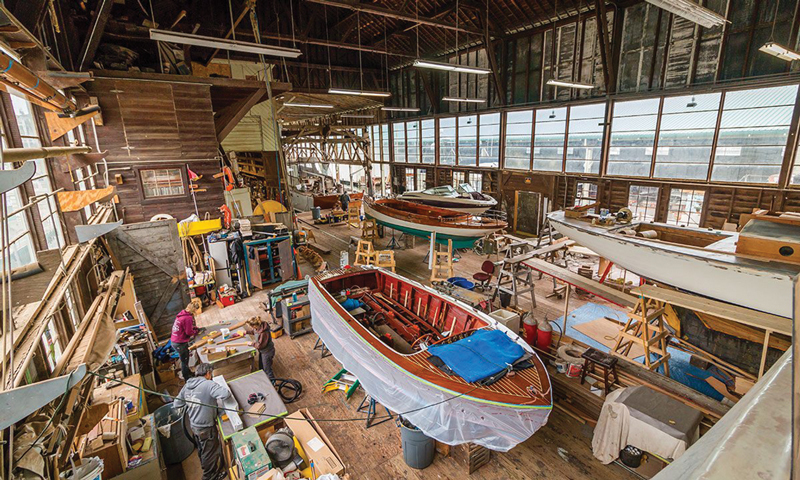 Anchor Jensen died in 2000 and the yard ownership passed to his son, Dewitt Jensen, with management assumed by Steve Evavold and Peter Proctor, with no significant alteration in mission: building and fixing wooden boats. See their web site for wonderful photos of the yard, past and present. It’s a great spot for a restaurant, but wouldn’t we all wish it still a boatshop, with the sound of saws and chinking hammers, and the smell of freshly cut wood emanating into the chill Northwest air through open windows?